The Lich King has posted the second part of his takeover of the Blizzard offices. It seems that all who cross him are falling. Kind of. There are also two card reveals in the video. We reported yesterday that the Lich King was taking an internship at Blizzard. Today it seems that he has taken his plan one step further. It is I, the Lich King. The time has come for you to bear witness as my brilliant stratagem fully unfolds. The accursed developers, their support teams, and that guywith the coffee . . . ALL will yield before the Lord of the Scourge! As you will have noticed, at the start, The Lich King reveals two new cards. 2 Damage for 1 Mana is already standard fare in Hearthstone. Arcane Shot and Holy Smite have seen play before, but have hardly set the world on fire. Breath of Sindragosa does have a Freeze effect on top of the damage though, and so it remains to be seen if this is strong enough to make it into Mage decks, and if so, which ones. 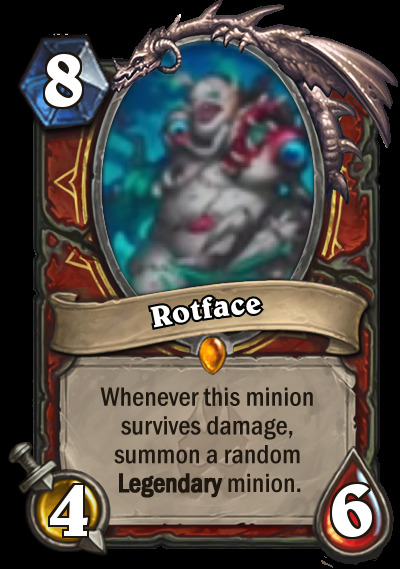 Rotface is going to be a nuisance for many decks to play against. It will be able to generate at least one Legendary minion a lot of the time, and if it generates two, it is probably game-winning. It is not as amazing as it first appears though, if you are not convinced, go to your dust page, filter by Legendary, and take a look through. There are quite a few mediocre Legendary minions these days. This is not to downplay the card too much, if it generates even a 3/5 minion, it has more than done its job. For a full list of previously revealed cards, as well as all of the information about the new expansion, check out our Knights of the Frozen Throne expansion hub. What's better? Arcane Blast or Breath of Sindragosa? Rotface - 8 mana 4/6, Whenever this minion survives damage, summon Shifter Zerus. 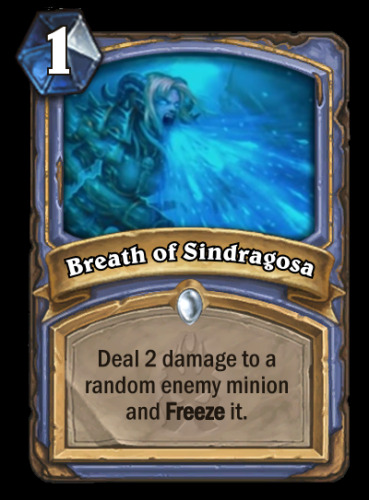 Breath of Sindragosa still gets destroyed by the new anti- jade idol card and that already makes me think that card wont see play. Its good for arena and might see play if we will have aggressive mage deck again, as its a pseudo arcane blast to abuse sorcerers appretince. I liked this one better than the last one. The cinema part especially. Dust... DUST... DO YOU EVEN PLAY HEARTHSTONE? A 1/1 with no ability would be the ultimate kick in the pants from RNG. Ouch! I was going to go with Patches the Pirate, but at least he has charge. And spawns a friggin' cannon out of your deck when summoned! If there's no cannon when spawned from Rotface, I'm DEing him.